D day itself is a military term that specifies the beginning (date and time) of a combat operation. There were D-days for the assaults of Iwo Jima, Tarawa and Okinawa among others in the Pacific Theater. Operation Husky, the invasion of Sicily, Operation Dragoon, the invasion of Southern France and many others. But it was the invasion of Fortress Europe and the Atlantic Wall at Normandy France on 6 June 1944 that so captured the spotlight of the world's people that it has assumed the title of D-Day. Elements of the Invasion actually began before midnight on 5 June, these were paratrooper and pathfinder units, tasked with certain objectives that would assist the Infantry and Armored Divisions as they hit the beaches and moved inland. The Allies were led by Dwight "Ike" Eisenhower, the Supreme Commander. The military name for the invasion was Operation Overlord. The Americans (US First Army) landed at Utah and Omaha Beaches while British 2nd Army with British and Canadian divisions landed at Gold, Juno and Sword. A naval armada of over 5000 ships crossed the English Channel, carrying over 150,000 soldiers that would go ashore on the first day of Overlord. Paratroopers of the 82nd Airborne and 101st Airborne preceeded the amphibious landing. Despite being scattered and missing their drop zones by many miles, groups would form and they would occupy the enemy while the landings began. The 1st Division, 2nd Division and the 29th Division were to land at Omaha Beach along with the attached Rangers units that were to assault Pointe du Hoc. The 4th Division, 9th Division and elements of the 90th Division were to land at Utah Beach. The defensive strategy of Normandy fell to General Erwin Rommel although overall command of all German Armies, OB West were under General Gerd von Rundstedt. The germans were expecting a d day, they new it was coming, the whole world new it would happen, however they anticipated that it would occur at the Pas de Calais although some strategists believed there was a chance of it happening at Normandie. Both locations were heavily fortified with large coastal guns encased in concrete pillboxes and many beach traps awaited the Allied invaders. Under command of the Seventh Army the german units included the 91st Infantry, 709th Infantry, 352nd Infantry, 716th Infantry and 21st Panzer Divisions. The battle involved many branches of service. The Army supplied the amphibious landing with men, weapons, mechanized armor, vehicles with supporting units attached to the various divisions including the medical corps. The navy and coast guard units supplied ships for the crossing and landing craft for getting to the beach. The US Air Forces 8th and 9th Air Force delivered the paratroops and performed bombardment to the coastal units to isolate the beachhead and prevent reinforcement of the defensive garrisons. They also provided air superiority that prevented any german aircraft from having any detrimental effect on the d day troops. The defensive Atlantic Wall was breached on 1944 d day and created the bridgehead on the Central European continent from which the allies could begin offensive land operations against Nazi Germany and bring about the demise of the Reich. Combat Reels is honored to bring you a lot of raw combat footage of D-Day and the following days of the Invasion of Normandy, also referred to as D-Plus Number, i.e. D+2, D+30. 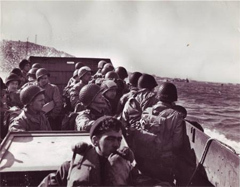 View men on the ships crossing the English Channel; watch them exit landing craft, rush the beach, take cover and finally begin to move inland. See new divisions, 2nd ID, 8th ID, 9th ID, 30th ID, 35th ID, 79th ID, 2nd Armored Division, 3rd AD and 4th AD as they arrive to enter the fighting as the Allies performed a huge buildup of troops before they could break out of the Beachhead. Watch footage of fighting in the hedgerows and the liberation of French towns. In our Invasion of Normandy Series of DVDs, watch the footage of your favorite Division as the Allies begin the defeat of Nazi Germany on the European Continent. If you are a ww2 enthusiast, enjoy the history, then we know you are interested in d day and the attack on the Normandy Calvados in Operation Overlord. Our DVDs will give you an accurate first hand account of this historic battle that turned the tide against Nazi Germany.